Tye Turman, Senior VP of Lodging Development at Marriott, speaks with David Sudeck, senior member of JMBM’s Global Hospitality Group® at JMBM’s 2016 Meet the Money® – the national hotel finance and investment conference. They discuss what’s in Marriott’s pipeline, PIPs, adaptive reuse, and Marriott’s brands, including Moxy and AC. David Sudeck: I’m at the 26th annual Meet the Money® Conference. I’m here with Tye Turman, Senior VP at Marriott, and I wanted to talk to you about your experience here at the conference so far. First of all, I wanted to see if you’ve ever attended before. Tye Turman: Actually, this is my first time, David. I’ve really been looking forward to this, I’ve heard about Meet the Money® for many years. I’ve always had schedule conflicts and unfortunately couldn’t make it, so it’s a real honor to be here. Alan Reay, President of Atlas Hospitality Group, speaks with Robert Braun, senior member of JMBM’s Global Hospitality Group® at JMBM’s 2016 Meet the Money® – the national hotel finance and investment conference. They discuss the California hotel market including sales and purchases, pricing, RevPAR, financing, and the impact of the Marriott/Starwood merger and Airbnb. Bob Braun: I’m with Alan Reay of Atlas Hospitality. He’s the foremost hotel broker in California, I’d say. At least that’s what I tell my clients, and I’ve always been proved right. Alan, thanks very much for coming and talking to us today. I think you have your pulse on the market, certainly here in California, more than possibly anyone else. 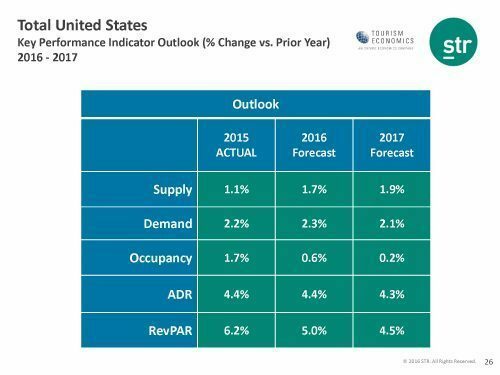 What do you see in the hotel market today? What kind of trends do you see? Alan Reay: During the first quarter we’ve definitely seen a big drop off in sales in California. In the U.S., down 52%; in California, down 35%; that really has nothing to do with the economic fundamentals, because RevPARs are still increasing, profits are up and a lot of the numbers are positive throughout California. It has been a fundamental shift from a buyer’s sentiment in terms of how they’re looking at deals and how they’re pricing them. We had a lot of turmoil in the public markets, as you know, in the first few months of 2016, and a lot of REITs have pulled out of the market, and a lot of lenders have pulled out of the market. So that’s created a disconnect between what buyers and sellers expectations are on pricing, which in turn has created a big drop in hotel sales volume. Bill Blackham, President and CEO of Condor Hospitality Trust, speaks to Bob Braun, senior member of JMBM’s Global Hospitality Group® at JMBM’s 2016 Meet the Money® – the national hotel finance and investment conference. They discuss Condor’s transition from economy chain scale into select service, extended stay and limited service hotels, RevPAR, and opportunities in the select service sector. Bob Braun: I’m with Bill Blackham of Condor Hospitality Trust. Bill, thanks very much for taking out the time to talk to us today. What are you currently working on? What’s Condor focused on these days? Bill Blackham: Condor has been involved over the last year in a lot of different initiatives that involve the transition of the company from once being an economy chain scale-focused entity into a select service, extended stay and limited service hotel company, with a platform that is growing in that new investment strategy at the same time that we are divesting the old investment strategy hotels. Therefore, you have multiple things going on at the same time. Combined with a recent private placement of equity into the company with a new investor, it’s been a very busy time. Bob Braun: So, what drove this shift from the economy (sector), up the ladder a little bit to the limited and select service? Bill Blackham: I think that the potential for stock growth was far greater in the space that we’re now pursuing. One of the problems with the sector that the company had previously been in is that the average size hotel was very small. And in order to get to a very meaningful scale to justify being a public company, one would have to own four-, five-, six-hundred of those hotels, which is unwieldy from the standpoint of managing that platform. I think that the platform that we’re going into also affords us the opportunity to have greater investor interest because it is a sector that continues to have above-industry growth in terms of demand, while at the same time is a space that has much higher margins than we are, as a company, traditionally in. So the higher margins combined with sort of a void in the space, the public company space of people that we’re going specifically after, the geographic markets that we’re pursuing, and the type of products that we’re pursuing really left an opportunity open to get highly accretive acquisitions. Jonathan Falik, CEO of JF Capital Advisors, speaks with David Sudeck, senior member of JMBM’s Global Hospitality Group® at JMBM’s 2016 Meet the Money® – the national hotel finance and investment conference. They discuss the current hotel market, the availability of capital, and what lenders and capital providers are looking for. David Sudeck: We’re at the 26th Annual Meet the Money Conference. I’m here with Jonathan Falik, CEO and Founder of JF Capital Advisors. Welcome. Jonathan Falik: Thank you for having me. David Sudeck: You’ve been a mainstay at Meet the Money® – we appreciate that, by the way. Jonathan Falik: Well, it’s one of my favorite conferences. David Sudeck: What’s the temperament like in terms of the marketplace? Jonathan Falik: People are cautious. Most seem optimistic, but are cautious and are in a learning mode. Everyone’s trying to figure out who’s saying what and who’s thinking what – which is interesting because normally people in our industry think they know everything.